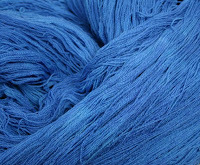 Blue Heron Yarns features gorgeous yarns for knitters and weavers. On sale are beautifully colorways in the following yarn textures. 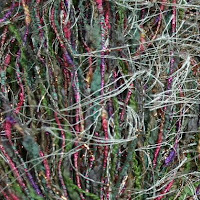 Beaded Rayon Yarn is a100% rayon hand dyed yarn with a nubby beaded texture twisted into the yarn. This yarn is perfect for knitters, crocheters and weavers and is available in 525 yard hanks. This yarn is DK weight. Blue Heron Yarns Beaded Wool yarn is a blend of 89% Wool and 11% Nylon. 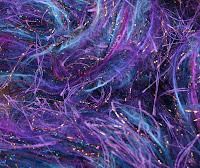 Beaded Wool comes in beautiful hand dyed skeins of 250 yards per 8 oz skein. Beaded Wool yarn is worsted weight and knits to a gauge of 4-5 sts per inch on a US 5-8 needle. Enjoy! It is beautiful in color and texture! Blue Heron Yarns Bulky Rayon Chenille is gorgeous chenille yarn available in 8 oz skeins with 250 yards and knits to a gauge of 18 sts per 4 inches. This yarn is wonderful! Blue Heron Cotton Rayon Seed yarn is a worsted weight hand-dyed yarn that creates a unique and very interesting texture for garments. Used by weavers, knitters, crocheters and other fiber artists, Cotton Rayon Seed boasts 475 yards per 8 oz skein and knits to a 16-20 sts per 4 inches on a US #6-8 needle. The colors of this yarn is amazing in its rich and deep tones. A joy to work with! 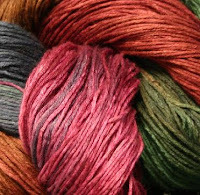 Ironstone Yarns creates fantastic yarns and yarn mixes that are fun! Many times, the garments created with Ironstones mixes resemble a party all on their own! Be the fun one on your block and go wild with the yarns and have lots of fun! Ironstone Yarn Dreamcatcher yarn is fantastically fun and gorgeously colored. It is perfect for any project including complete garments, edgings or basic scarfs! This yarn just screams fun stuff! 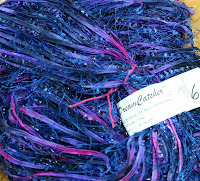 Dreamcatcher yarn is a blend of 57% Nylon, 23% Wool and 20% Polyester yarns that knit to 2 sts per inch on US #17 needles. Each hank is 122 yards. 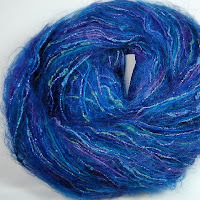 Ironstone Yarns Pizzazz yarn is three wonderful yarns wound into one. Each skein contains Felicia, Eyelash and Paris Nights wound together to create a stunning a yarn to work with! Pizzazz knits to 2 sts per inch on US #17 needles and each skein comes in skeins of 122 yards. Ironstone Yarns Showstopper yarn is well-named! Showstopping!!!! People will stop you on the street to inquire about your garment or scarf! It is true! It happens to me all the time with my cool scarf made from Showstopper! Showstopper yarn is 3 yarns wound together - Mohair, Eyelash and French Fancy Yarn. Showstopper knits to 1.5 sts per inch on a US #17 needle. Each hank is 100 yards. Very, very cool yarn! Ironstone Yarn Sun yarn is a wonderful mix of three of their popular yarns all wound together to create a wonderful splash of yarn! 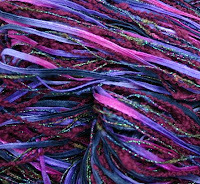 Each skein contains Felicia, Paris Nights and Streamers Ribbon yarns! Sun yarn knits to 2 sts per inch on a US #15 needles and is available in 125 hanks. Let the fun with the Sun with begin! Ironstone Yarns Sunset yarn is a combination of 50% Mohair, 24% Acrylic and 9 % Wool, 13% Nylon, and 4% Metal. Each ball is 89 yards per 70 gram ball and knits to a gauge of 2.5 sts per 1 inch. Perfect for scarfs, shawls, accent yarn and lots of other creative uses! It is gorgeous! Interlacement Yarns creates beautifully dyed yarns for all fiber artists including knitters, weavers and crocheters. Interlacement Yarns claim to fame is how their clear colors mingle to create additional striking colors. The colorways that they have developed are as bright as the industry has seen. Interlacement Yarns Spider Web is a wonderful hand-dyed, 2500 yard, 8 oz skein of spectular laceweight yarn that is hand-dyed by Judy Ditmore. Simply exquisite! Interlacements Yarn Kansas is a soft and luscious blend of 85% rayon, 15% flax. 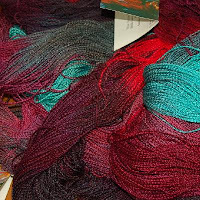 Each skein is hand-dyed by master dyer Judy Ditmore. Each 8 oz is 600 yds and each 12 oz skein is 1200 yards. The suggested care for this yarn is hand wash or dry clean. This yarn knits to a recommended gauge of 7 st per in on US #4 needle. This yarn works well straight knit or in a lacey pattern such as chevrons or feathers and fans. Oregon Worsted Yarn by Interlacements Yarns is a classic worsted merino wool yarn that is availble in wonderful hand-dyed colorways. Good for knitting and felting. Oregon knits up into a soft comfy sweater, or most any other project you want to tackle. Oregon is 200% Merino Wool that available in 8 oz skeins that are 560 yards and knits to a gauge of 5 st per in on US#9 needle.